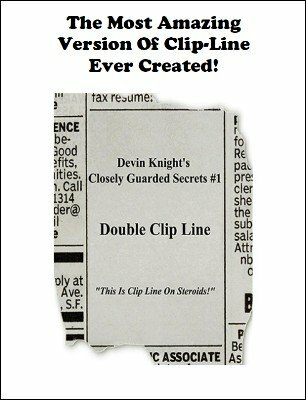 Devin Knight's Closely Guarded Secrets is a new series that will include never revealed secrets that he developed over the last 30 years. The first release in this new series is Double Clip Line. This is not the old Snip-Snip Want Ad test. This is Clip Line on STEROIDS! Closely guarded secrets that take Clip Line to a new level. Here are the effects included in the first release of the series. CLIP LINE EXTRAORDINARY - Two different newspaper columns are shown. One column is marked with the number 1. The other column is marked with the number 2. This is so the audience can tell the columns apart and see that the columns are right side up. You hand someone a prediction to hold. The two columns are place together. Taking a pair of scissors you cut away from the TOP OF BOTH columns until someone tells you to stop. You do this UP CLOSE allowing the person to read some of the lines before you clip them off. Next, you start cutting off lines from the bottom of BOTH columns at the same time until another person tells you to stop. You cut the lines letting him see and read the lines as you cut them away. The participants can stop you anywhere during the cutting. Once done, you immediately and with NO SWITCHES hand out both columns to the participants. Remember, each column is still marked with a number on it. Your prediction is opened and read. You have correctly predicted the top line left on column 1 and the bottom line left on column 2. Baffling beyond words and will fool many magicians who know the old methods. NO SKILL. No sleights and no switches. No specially printed papers, so there are no refills to buy. Use any newspaper. CLIP WORD - A new and novel approach to the classic effect. In this version the participant has the choice of which end you cut off lines from. You can either snip lines off the bottom or off the top. It makes no difference, but the outcome will be different depending on which end the participant tells you to cut from. A prediction is on the table in full view from the start. After the participant tells the performer to stop cutting, he immediately hands the column to the participant to check the last word on the column or the first word depending on which end he had you cut off. Unbelievably, you have predicted the exact word the stopped he you at. Instead of a prediction, you can call your wife or girlfriend and hand the phone to the participant. She tells him the word he is thinking of! Do this without the use of any nail writings, carbons or secret writing. No skill and extremely easy to do, but mind-boggling to your audiences. NO-TOUCH CLIP LINE - Do Clip Line WITHOUT touching the column. You hand the participant an ungimmicked column cut from any newspaper and pair of scissors. You turn your back and he cuts off a block of lines from the column. You do not know (really) how many lines he cut off. You have him cut off a few more lines, again you really don't know how many lines he cut off. Now hear this, with your back still turned, you tell him the last line of the remaining column in his hand. You can do this over the phone. You mail a column to a friend with a note to get a pair of scissors and call you when he gets the column. He cuts the column while on the phone. You ask NO questions, yet, you are able to reveal the last line left on the column. One of the most amazing telephone effects ever created and it is almost self-working. So easy to do, you will kick yourself for not thinking of it. 1st edition 2010; 15 pages; photo illustrated.